We had an opportunity to take the kids to a water park and have fun as a family. Sometimes these weekends are hard for me. Often times Lydia does not travel well and it feels as though she takes something away from the other girls. As wonderful as an opportunity this is, it is also a time to "expose" my little angel to others, her scars show, she is on display and she is right alongside others her age. With that comes comments that you can't escape, but it also, in my mind, is an opportunity to compare Lydia to other typical kids her age. I know I shouldn't, but I do, it is hard not to. And sometimes I just get sick of hearing "Oh she is so tiny." "Oh, look at those scars!" "Isn't it nice to have a child that is happy all of the time." To my surprise, the water park taught me a lot of wisdom and I am going to try my best to relate it to what I have learned about having a child with Down syndrome. I am not a writer, don't claim to be one; but I love to share my struggles, our journey, and what I have learned. I pray that I am able to connect the wisdom I have learned as well as it seems to be clicking in my head! Ellen and Allison were encouraging Lydia to go down a slide or splash in the pool. They were running here and there and every where. They were making friends and enjoying just being kids. They were carefree and were loving life. They were laughing and screaming and smiling and laughing some more. It was a great site to see. There was nothing on their mind other than having fun. I watched Lydia play and splash and I noticed she is behind a little bit compared to others her size. However, I began to notice all of the small stuff, the important stuff about what goes into the process of accomplishing her goals. I noticed that she was able to walk very well without her SMOs, she had a very small base, which is simply amazing. She was doing the "Lydia-sized" stairs extremely well with little to no help. She was able to walk up and down (and up and down and up and down) that steep, slippery slope without losing her balance. She was very social and interested in other people. She wanted to hug every baby/toddler who was crying. She was happy and content just being Lydia. One of my biggest fears with having a child who has Down syndrome was her being delayed and what that all meant. I was told several times life will be at a slow pace; her pace. What does that all mean? Lydia truly has taught me what that means and it is NOT a bad thing, not even close; it is the biggest blessing ever. Slowing down, understanding the process, and just being able to embrace every moment has made such a profound impact on my life. I realized that I have missed out on so much with Ellen and Allison by thinking faster is better. I missed the joy in realizing how much effort goes into every little accomplishment. I missed things because I was too busy looking for the next huge milestone instead of embracing the small components that make those big moments. I missed out on celebrating the things that were important to my kids because I was so focused on those major things. In the changing room at the water park, I put Lydia on the bench to get her into her clothes. I had her naked and I was kissing her belly. There were three ladies staring at Lydia. I couldn't understand why, but I thought it must be because she was so cute (well probably because she was so small). When I walked out by my husband it dawned on me that they were looking at her belly. Her belly tells a beautiful story of survival. It is a story that we celebrate and embrace. I love it, but I am so use to it, I didn't even think that they were looking at the many scars she has on her belly. What a great moment for me. This is a huge fear of mine, what will others think when they see her scars? There were no fears standing in my way, just pure joy of kissing my daughter's belly and embracing that moment. How simply wonderful! We all have a story to tell, whether big or small. We all have endured trials of many. Some trials have made us better and others we have barely survived. But all of these trials have shaped us and molded us in to who we are today, for better or for worse. We can't tell the future, we can't tell how our kids will turn out, we don't know what God has in store for us in the next moment. However, we can take each moment to live and embrace what God has given us. Instead of hurrying to the next thing, making life a race of who will finish with the biggest and best, we are to live each moment, to be thankful, and to appreciate every little thing we have been given. Thanks to the many people in the water park that put that into perspective to me, that made me understand the huge blessing it is to have Lydia in our lives, to have learned these lessons and to continue to learn the lessons God has for me and our family. I never thought that a weekend at the water park could teach me so much. It is simple, but it is profound. Life is never going to be what we think, but it can be so much more if we embrace what we are given. She is more than a diagnosis, she is more than being behind. She is more than what other's think. She is mine, she is a beating heart, she is teachable. She may not be where I thought she should be, but she is exactly where God wants her to be. Take time to be proud of who you are, the moments you were given, and embrace the little stuff, for that will pass too quickly and you will never be able to get it back. Don't be afraid of the unknown because that will change you in ways that will rock your world. Don't listen to things of this world because they are talking without having the experience. Don't let your fears get the best of you and talk you out of something wonderful. Take each moment for what it is, embrace it, learn from it, and don't cheat yourself out of some of the best blessings. Simple wisdom from the water park: embrace each moment, it does not matter what you look like, your size, your color, your disability, your wealth, your physical appearance....it is your heart that is beautiful (make sure it is)! Don't let those small moments pass you by because they are the best reasons to celebrate! Don't let fear rob you of blessings! Have fun most of all and enjoy this moment. This past weekend we had the privilege of getting away as a family. Those days are very rare for our family. It takes a lot to pack up everyone, money is tight, and Lydia is just a wild card. She does not travel well, and often times it is so hard on her that it is not worth it. As I was laying on the bed, my husband sleeping, my older girls sharing the Kindle, and Lydia sleeping; I just thought, we never get away from our real problem. Lately, we have really been struggling with Lydia and her eating. I know, I have said that over and over and over. However, this is a real problem for us. This is challenging and quite frankly it is destroying me personally in some aspects. I wanted to write this entry today really for me. I need to be able to put these things on the line and hopefully recharge myself a little; knowing, with God's help, I can tackle this challenge too! I also think that it is important to share these struggles with others. 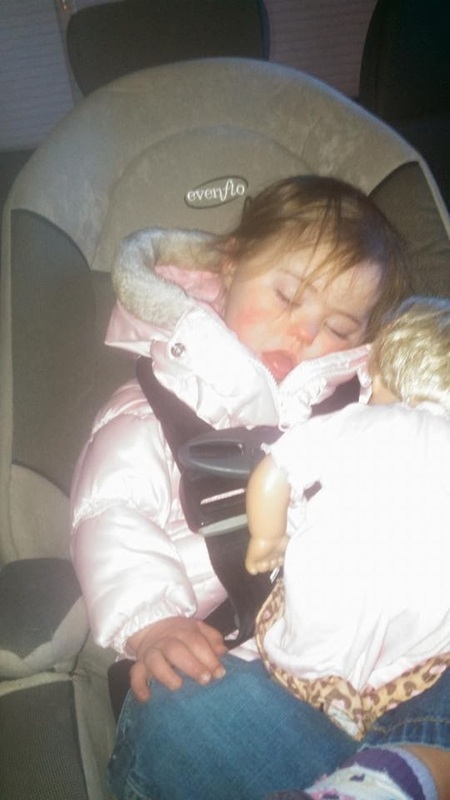 And it is important to remember, that her eating problems are not because she has Down syndrome, some may complicate it because of that diagnosis, but this is because of her EA (esophageal atresia) diagnosis. Getting up in the morning feeding is already on my mind. Once she wakes up we need to start to try to get fluids down her. She does not have a sense of hunger (I do believe we are slowly getting there) and therefore drinking and eating does not come naturally. And to complicate things more, she was tube fed for the first year and a half of life. She drinks, on average, 8 ounces of a pediatric drink a day. Her goal, when she was followed by GI, was 16 ounces at the bare minimum. She does not drink water or anything else. And believe me, we try. We have spent a lot of money on different cups and straws and smoothies and juice and freezing things and whatever else we think may have work. So far, we are rejoicing with this 8 ounces (some days more and some days less). Then it is time to get in the kitchen, although most times I am dragging my feet. I don't like this part of the day. I have to prepare her medicine and her food. I guess about what kind of food she would like to eat. I allow her to choose if she will. I have to try to guess if we will be on baby food or if she will allow some kind of table food. Just because it worked yesterday, does not mean that it will work today. Her staple has been corn and chicken. So it is a constant guessing game. We start off each meal with a prayer. I pray for God's strength because I cannot do this on my own. When I try, it is a total disaster. I completely lose myself and turn into someone who is not a good role model for my children at all. I try to make the prayer last for as long as possible, but I know at some point I will have to try to feed her. Sometimes when I present the first bite she takes it, but most times it is a fight. We use brushing and wake up exercises. We try to use music and games and toys to get her to eat. We bribe her. We yell. We play hide and seek. We wear silly things on our heads. We dance. We pray. We cry. We bribe. We run around the table (I guess it keeps me fit!). We make up songs, we use our other children, we use strangers we basically do whatever it takes to get her to eat. We have found that we are shifting from it being a focus that she needs to eat because she HAS to gain weight, to more of a thing we have to do because she needs to eat. I think it is exhausting. Just once, I would love to sit down, present the spoon to her, and just have her eat. I would love meal time to take only 20 minutes instead of hours. I HATE PLAYING THE GAMES, I AM EXHAUSTED. But that is a huge praise that her pediatrician has said he is super happy with how she is growing, her cardiologist is happy, so something is working! When we are out to eat, I find myself longing for that other family who can sit their child down and watch them eat. I would LOVE the mess, the change of clothes, the throwing of food as long as they would eat. I long that my two and a half year old daughter would eat something other than baby food. Not only because she should be on table food like every other child, but it is expensive. I try to make some food, but there are certain foods that she will eat that I make and others that she will only eat canned baby food. Sometimes I find myself getting jealous and that is just not a good thing at all. I really wish, at times, we didn't have this battle. But then I remember, very vividly, there was a time while I was driving in the parking structure of the Children's Hospital. I was talking with my dad and he was very concerned about this feeding tube thing. That was new to all of us to deal with. He wondered if she would ever eat. He wondered how she would eat. Then I have to take a step back, this is a journey, this is a process. We have already accomplished so much more with her than what we thought. We even transferred doctors because she had a doctor that told us she should be in an institution, she would never eat on her own or amount to much. Look where we are at. Praise God! There are days like today that we experience small victories. Lydia would not eat this morning. I had the opportunity to hold Ellen and snuggle with her. I had the opportunity to show my children how we can accomplish things with God's strength. Most mornings I fail, I try to do it on my own, but today, today I relied on God's strength. It took a long time, we played games, we used music, and watched videos, but she ate her entire bowl. We all walked out of the house with our heads held high in victory through Christ. But see it does not stop there, because lunch and dinner follow too. There are also snacks and trying to get milk in between the meals. And if we wait too long to feed, she gets all out of sorts. She does not feel that hunger, she does not have a stomach like us. So we have to walk that balance. It is hard sometimes, very hard. That means always planning ahead, carrying food with you, making sure you have what you need to meet her needs. It is a long tough journey for me. Some of you reading right now may have even tougher journeys, may have more difficult things in your life. However, this is what is tough for me. The hardest thing is, she needs to eat to live, to grow. Sometimes it is like watching your child die right in front of you. All I can do is offer and try to feed her, I cannot make her eat. We try, we give it our all, but she has to do the eating part. I have to say that more and more I am convinced it is a behavior. She is just sitting there smiling and laughing at me as I am trying to retrain myself from walking over the edge to completely crazy. I feel like she knows and understands. She knows and understands so much, why would she not be able to understand this? She may not know why she has to eat, but she does understand that when she is in her high chair she needs to eat what is on the spoon. This adds fuel to my rage in feeding her even more. And then the balance of don't push too hard because it will become a psychological issue. Whatever happened to "Listen to your mom." I battle the issue that if I say you are going to eat, you are going to eat. These are all uncharted waters for me! Feeding tube. Yes, we took that out and against medical advice. However, life has been much grander since. And the reason why it came out was because it was twisting her small bowel. She had to be put on medicine for constipation and she was in constant pain. Her tube leaked and her skin was completely broken down. If we fed her by tube she would not eat by mouth. She actually has been consistent in weight gain with her tube out. So I do stand behind that decision, and we knew when she had it out, that there was a chance it might have to go back in. We are not at that point, but I do think it was one of the best decisions to take the tube out, for her. She is gaining, or at least where her doctor is happy. She is growing well and developing like a champ. She is very healthy. So there is no talk about putting the tube back in. However, my sanity, it is gone! I hate feeding her. I hate the games. I abuse food myself because she won't eat. It is a lonely road. Most people tell me I am crazy because she looks so good. I am crazy because she looks good, because feeding has been my nightmare, my life, my secret that I hate. Then when you are out in public and people tell me how small she is. Oh don't get me started. While I know she is exactly where God wants her, that comment casts enough doubt about if I am doing enough. That comments casts enough doubt that maybe there is something more. And this crazy vicious cycle starts up again. Over and over and over. UGH. I love food for myself because it does not talk back to me and it provides some immediate comfort. See it is tough to talk to my husband about it because he is just as crazy as I am. He has no answers or suggestions. We rely on the expects, but they really do not understand unless they are here feeding her. As soon as you think you have a victory with something new, as soon as you think you found that one thing that will work, she changes, she no longer likes it, she won't use that. She has changed her mind that she does not like that technique anymore...no warning, no indication, you are left to find another way to feed her. The professionals have great suggestions, but she is just her own monster because of her very unique anatomy. It has been a struggle for all involved, I think. But we admire our team, they continue to work with us and give us suggestions! So the cycle goes on and on. Yes, I am super thankful that she is where she is at. I understand this is a process and a journey, that we may battle this the rest of our lives. At this point, I feel completely defeated. I feel exhausted and angry. I don't understand the plans and why we must endure this. But I know there is a plan, I know God is holding us; He has shown us small victories here and there. I guess this struggle would be much like a disability that you cannot see, a chronic illness that does not present itself all of the time. It is a struggle, like any other, that you constantly deal with. It is a problem where there is not a fix. It is something you must continue to battle and fight. You give it your all and trust that God will carry you the rest of the way. Sigh.....it is time to feed her once again. What should I feed her? What flavor will she like? What games will we have to play? Will this meal be a success? And yet, I continue to battle this vicious cycle because she is worth it, because she is my secret that keeps me going. She pushes me to the end, but in the end, she is the secret that makes me go. She is nothing short of a miracle and I don't forget that. Today starts a very important day for our family, it is Congenital Heart Disease awareness month. Wear red to spread awareness. Why is awareness so important? Because CHD affects 1 in 100 people which makes it more prevalent than any other childhood disease. There is no cure and often times it goes undetected until it is a big problem. There is little funding for research on CHD. This makes me sad. There has been HUGE advances in CHD in the past years. When we were in the hospital our nurses would tell us stories of people being completely blue due to their heart. They would tell us that not too long ago, they did not have the technology to fix babies hearts. And even sadder, babies with Down syndrome were often the last, if at all, to get their hearts fixed. Wow, I could not imagine my life without Lydia. I realize it, everyone wants your attention, everyone wants to create awareness, everyone thinks their cause is more important than the next. It is what is close to you. I had no clue about CHD until they diagnosed Lydia prenatally. We were one of the blessed ones that they found her defect before hand. Not every family is that blessed. It is a long road for many. We walked the halls of the CICU and saw tiny little babies on ECMO (a heart and lung machine) fighting for their lives. We heard the cries of families realizing that their little one would never come home. We talked with families who were basically waiting for someone to die so their little one could get a new heart. And then once that heart was in place, it requires a lifetime of medicine and check ups. Although, AV Canal is a fairly common defect, since there is an artificial valve and wall, there could potentially be problems down the road. This requires her to be monitored yearly with Echos (pretty non-invasive) and EKGs. While it is not always poking and prodding, there are many other risks that she faces because of this. This is something that she will live with for her entire life. There is NO CURE. Yes, this is close to our hearts because Lydia has it. I am not asking for anything other than to make yourself aware. Knowing gives you power. Chances are, at sometime in your lifetime someone you know personally will be born with CHD. Or it may be someone you meet who has already been affect by CHD. There is no known cause why children are born with CHD. It is said that often times before families know they are pregnant, their little one's heart is already formed with CHD. Yes, there are surgeries that can correct the defect, sometimes, but because it is not made as it was designed to, there are often complications and problems. So, I will get off my soap box. I hope that I created some awareness for you about CHD. It is important to me because it affects our families and I have seen how it can rip families apart. Help create awareness so people understand just how prevalent it is and how it affects families, and that it does need some funding. I also have to say that I was so touched because Lydia's sisters school is all decked out in red today. How awesome that is to know that their school supports our family so loudly. We are so blessed to have so many people who back us and support us. Thank you! Maybe you are just like me when you heard the news, received the phone call; "Tiffany, I just wanted to let you know that there were markers that your baby may have Down syndrome. Don't worry, there is only a one in one hundred chance. Besides we are not doing anything different, so just carry on and know the baby is loved." Comforting words, yet such words of terror. The tears started flowing as my husband had just drove in the driveway. I was a sobbing mess by the time he climbed the stairs into the kitchen where I was standing. He sent the girls upstairs. What could be the matter? As I uttered the words Down syndrome out of my mouth, for the very first time, I felt a sense of peace. It is a peace that I knew no matter what, things would be OK. However, the fear and the what ifs and the it's not fair set in. There was worry and a bit of anger, confusion and major guilt. As my husband held me and we prayed; I knew it was going to be OK, somehow, I loved this baby no matter what. I realize that not every lady is blessed enough to have a supportive OB, a supportive husband, loving family, and a great church family, incredible neighbors, and caring strangers. I do believe it was God's might Hand that had been at work long before this news preparing just the perfect support group (if only I realized that at the time!). I can only imagine (and not that I want to) what it would feel like to have an unsupportive OB, husband, family. I know that often times the diagnosis is handled based off how it is given. Often times it feels like doom and gloom; like it's the end of the world. We mourn over something we never had. It seems really silly, but it is real and we realize just how little we are able to control our life. For us, the added stress of major complications were given and I learned really fast how to trust God. How to lose everything to gain something far greater. As we sit here well into two years of this roller coaster journey, I think back to that phone conversation with my OB. I read stories (and to me they really are horror stories) of OBs that just are not supportive, of people apologizing for the pregnancy, of doctors, nurses, friends, family treating this diagnosis like something it should not be. Fearful, yes. There are probably so many more unknowns by having this diagnosis. You know there are greater health risks, more of a developmental delay, and no one really can tell you what your child will be like. They are labeled before they even have a chance. However, much of our life is like this; the difference being, there usually is not the astigmatism given to it that Down syndrome seems to carry with it. No one told me what my marriage would be like. No one said there would be days of horrible pain and suffering. No one told me how hard it would be. Instead it was one big celebration after another. There was always an encouraging word. No one could predict the future of my marriage, what trials we would have to go through or things we would encounter. I can think of all kinds of examples in my life like this. So my heart breaks for those horror stories I hear when people are just so unsupportive. Do these people know what they are talking about? Have they ever encountered a person with Down syndrome before? Where are they gathering their information? I never realized what a difference these questions made until I was wearing those shoes. See the Down syndrome community is nothing but supportive and proud. There is happiness along with the trials and struggles. But, I have yet to meet, a family who said that it was doom and gloom. Hard, yes, but very manageable and rewarding. I am sure there are some out there that maybe have different views, I am just saying all the folks that I know are so very proud of their little one and say that it is the most rewarding thing in their life. So what did I think life would be like when we received this diagnosis. I am not sure. There was a lot of fear and I wondered what life would be like, what my little one would look like, what she would accomplish. I wondered what the future would look like for our family. I wondered what obstacles we would face and how we were going to do this. And when I think of this now, without the diagnosis being so overwhelming; with Down syndrome just being part of who we are, these are normal questions that any new mom has. No one knows the future other than God. We must trust in Him and rely on Him to get us through these complicated situations. He does not create junk (I hate this saying, but it is true)...all life is precious; even with an extra Chromosome. What did I think when we first received the diagnosis and now are two totally different things. Life is normal, just as it should be. There are days that are super hard, but not every one of those hard days are because of Lydia. Being a mom, in general, is a hard thing. Being a wife is a hard thing. Being a daughter is hard sometimes too. There will come a time, and usually does not take too long, that Down syndrome is just Down syndrome. There are no definitions, there is nothing different, and the fear is there; but it is just normal fear that every mom has. Yes, in our case, we deal with more because Lydia has extra medical needs; but even those are starting to become just routine. That is just the way Lydia is! Lydia is delayed, but she makes up for that in her wit, her character, the way she cares for others and shows love. She constantly is making us laugh, or run after her like any other two year old. She gets into things, she does not listen, and she likes to do things her way. Therapy is just a formal play time for us (yes, sometimes it is hard, but it is becoming life as we know it). Doctor visits are fun because we are friends with our doctors! We have a HUGE extended family, many new friends, and lots of strong relationships. See everything that I was scared for no longer seems important. I know that you may be standing on the bottom part of the mountain and it seems impossible to climb. You may not want to climb it, you may be scared, you may have hundreds of other excuses. But just because it is unfamiliar ground does not mean that it is bad. I guess I just have been feeling like writing this because if you are like me, it is scary. And I don't like to imagine what it would be like to be given this news as if it was a death sentence. Especially now that I have been on this journey for a couple of years, it is anything but. I find myself looking deep into Lydia's eyes and just smiling because my heart is so full. She is one amazing girl and I am so blessed that God chose me. Please, if you are just starting off on this journey and need some encouragement, I would LOVE to help you along. It is scary, but almost anything that is good and right is scary. Take it from people who have walked on that path and not people who haven't!